FOP: Smooth, sweet. 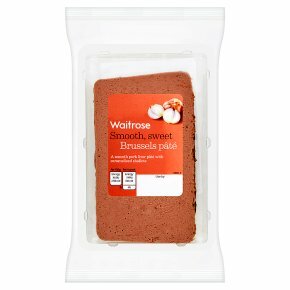 FOP: A smooth pork liver pâté with caramelised shallots. BOP: Farm Assured pork liver and shallots pâté. Waitrose work closely with our suppliers, to ensure selected farms meet our specified Belgian pork standards for animal health, animal welfare and traceability. INGREDIENTS: pork liver (32%), pork (19%), pork fat, water, caramelised shallots (8%) (sugar, shallots), tapioca starch, nitrite salt (salt, preservative sodium nitrite), pork rind, dextrose monohydrate, sugar syrup, preservative potassium acetate, spices (white pepper, nutmeg, mace, ginger, coriander), shallot powder, flavourings (vanilla flavouring, green tea extract, rosemary extract), antioxidants ascorbic acid, sodium ascorbate.